So, we are officially in 2019! A lot of us may have made New Year resolutions (some long lasting, some too short lived). But in this article, instead of giving goals and ambitions, let me try something new. 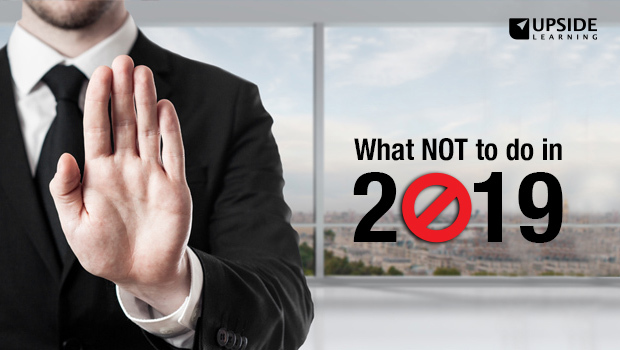 Let’s make a list of things that are a no-no for 2019. There’s one common mistake many of us make: that of using the terms ‘learning’ and ‘training’ interchangeably. But there actually is a subtle distinction between the two because learning is not the same as training. While you can create and deliver training, learning is very personal to the learner. And I’m certain most of us understand this but still continue to make the mistake when we design new programs year after year. You cannot ‘force’ learning upon anyone. Training comprises of a series of structured, very specific activities that have at their base clearly stated performance objectives. Learning on the other hand is an individual/personal process and people may learn every day on the job without taking any formal training courses. Companies that force their employees to ‘learn’ may actually end up turning them off the actual process of learning. So think what are you after – just delivering training or ensuring learning happens. Games and gamification have become incredibly popular and with good measure. When applied rightly, gamification has showed improved learner engagement, retention rates and better application of the subject matter learned at work. But that does not mean that it is always necessary, or is the solution to all types of learning challenges. Gamification can become a waste when it is poorly designed. Your staff can easily spot when you add a game wrapper over assessments, and get turned off immediately. MicroLearning too has been a buzzword in the last couple of years. It is a great method of implementing learning in small bite-sized chunks that can be easily accessed by leaners when they need – much like performance support. But microLearning does not work in every situation. In fact some of us may still have misconceptions about how long should microLearning be with opinions differing vastly. It is best to not go for any of the shiny objects just because there’s a buzz. You need to evaluate if it helps your organization with a particular learning situation. Although Compliance Training is an inseparable part of an employee’s work life in any organization, the blunder that some companies (banks especially) make is pushing a lot of it as mandatory training. Worse still, they do so even before new employees actually start working. It is natural that organizations want to ensure that their employees (especially the new staff) are aware of the various policies, rules and risks during their work. However, with a lot of Compliance Training done via eLearning (and which is usually not designed for learner engagement) the workforce just ends up developing a negative view towards eLearning in general. Effectively, with the way compliance eLearning is pushed in most organizations, we are setting ourselves up for failure. Typically L&D or business decides they need a certain training to be done for the staff to fill knowledge/skill gap they have observed. Most often the solution is a single learning intervention ranging from 30 min to 1 or 2 days. However, fact remains that we can’t retain a lot from long courses. Anything more than 20 min is a stretch for most learners – leave aside the full-day workshops. This means that a single learning program in the form of ILT or eLearning is not enough. It should ideally be followed up with spaced learning giving opportunities to learner for revisiting the content and/or for applying what they had learnt to specific situations they may encounter in their jobs. A well designed spaced out extended learning program can have much higher retention and application rates. For effective behaviour change think ‘learning campaigns’ instead of courses. Most L&D programs have as their foundation the objective of bringing about a change in behaviour or performance of learners. The success of these programs is (or should be) measured through whether this objective has been met or no. However, smile sheet and assessment results are all that we care for – most often. If we want our learning interventions to be effective and have the right impact, we need to measure business impact that the eLearning is having OR behaviour change (performance) that can be observed. Simply put no business undertakes a training initiative just for the sake of it. So let’s measure what matters. So, while making resolutions for the New Year is a good thing, it is also important to take a stock of what we wish to avoid in the year. Now, is a good time to look at all that we want to keep away from in order to devise effective learning strategies. Here’s to a happy year filled with some great learning!